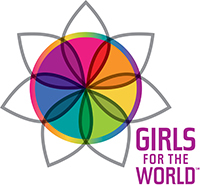 GIRLS FOR THE WORLD encourages girls and their mothers to join in circle just as they are — ready or not, educated or not, broken or not, strong or not—to do the work of self-awareness and mutual support through which our minds, voices, bodies, imaginations and actions become potent and strong. The power of “Hineni” is saying “Here I Am” to ourselves and one another. from Ounaminthe, Haiti. 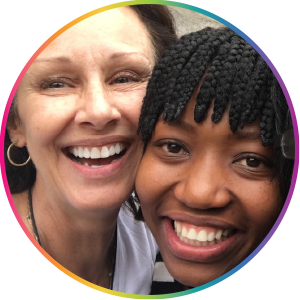 Evelyne has been a participant, translator and facilitator of GIRLS FOR THE WORLD programs. a student at St. Martin de Porres High School, in Cleveland, Ohio. Tereiza arrived as a refugee from Egypt and has been a participant in GIRLS FOR THE WORLD programs. Founder and Executive Director of GIRLS FOR THE WORLD. Tickets available now until May 19, 2019. Karen Hanson holds an undergraduate degree in Communications from Cleveland State University and a graduate degree in Ministry from Ursuline College. She conducts lectures, retreats, workshops and children’s programming related to empowerment through self-awareness. She also works to build bridges of awareness, understanding, and connection by sharing her stories and experiences with organizations about her travels in India, Nepal, Haiti, Lesotho, El Salvador, and Peru. She discusses the realities of gender injustice and such needs as education and clean water. especially those marginalized by gender, socioeconomic, or life circumstances. Africa, Haiti, India, Peru, and the United States.